“Child 44” is based on a novel by a British writer (Tom Rob Smith) and was adapted by an American (Richard Price) and directed by a Swede (Daniel Espinosa). It has that fatalism, that “well of course things are awful, that’s just life” despair that runs through so many Russian works of literature, art, and film. It makes it likely to be a challenging film for American audiences. This is the story of a government agent trying to stop a man who tortures and murders children – and all the challenges that agent faces because his government forbids him to say the deaths are murders. This is Stalin’s Russia, a communist utopia – and there are no murders in paradise, as one of the characters comments. Leo Demidov (Tom Hardy) refuses to give in, in part because his wife Raisa (Noomi Rapace) is seemingly-randomly selected to be revealed as a spy, and the pair are exiled to a tiny town in a miserable part of Siberia. (It is, Raisa observes, their “turn” to be accused as traitors). 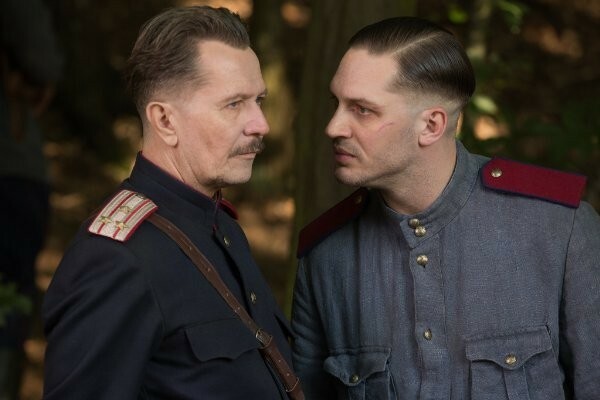 The military leader in the tiny town, General Nesterov (Gary Oldman) doesn’t trust Leo at all, and is very suspicious when Leo starts insisting that a boy killed locally was obviously murdered by the same person who killed a boy back in Moscow. Their uneasy truce as they start cautiously investigating turns into a solid partnership – but this is not a buddy movie. There is no lightheartedness here. What “Child 44” does have is amazing performances and a thoroughly engaging thriller of a story. Hardy is already known for his acting skills, and he does complex, thorough work here. Leo is a simple man in a far-from-simple world, and as the film goes on, his beliefs about himself and his life are challenged one by one. Oldman’s Nesterov has seen it all and figured out how to survive it all, and while he still has the heart of a man who believes in justice, it’s under many layers of cynicism from long years of serving his country. Rapace does solid work with Raisa, especially in the first part of the film. Raisa’s character arc is an interesting one, and Rapace does her best, but the second half of the film gives her almost no dialog to show the changes her character is clearly intended to be going through. It’s a major flaw in the film, but it’s essentially the only one. The antagonists are sharply drawn, and while the story takes a bit to get going, once it starts to gain momentum, it doesn’t slow down. The cinematography and detail-oriented visuals reinforce the overarching feel of paranoia, helplessness, and despair. This is not a feel-good film, but if you are looking for a tightly-woven, old-school thriller, “Child 44” will hit the spot.